This seems like a perfect mystery for a web-savvy ad guys like you. A friend sent me this video of James Franco on YouTube. It's supposed to be a real tribute, but it's too funny and has to be fake. Googling some of the stuff he mentions in the video brings you to WonderGlen.com, which is supposed to be a TV production company. You can actually log into their intranet and read their emails and memos to each other. They have video reels of their supposed TV shows, too. It's all strange but hilarious. I found some of the WonderGlen characters on Twitter and saw they were following you, so you might have been tracking this longer than I have. It's some kind of viral ad campaign, but I can't figure out the angle. 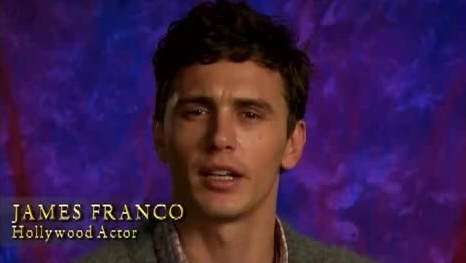 James Franco doing comedy videos makes me think of Judd Apatow, but what movie are they promoting? I also found the same video on Funny Or Die, so maybe it's a Will Ferrell thing? Anyway, I'm at a dead end, so I thought you might want to investigate. It's a funny site no matter what you end up doing with it. If you figure it out, please let me know. It's driving me crazy. First, does that not read like it clearly comes from a person who is dying to have someone, anyone dig into this further? yes, it dopes. Second, there are no Wonderglen Twitter followers to be found. Oh sure, there's a Wonderglen Twitter name but it has zero friends, zero followers and zero tweets. Strike one. We like Sarah. Oh, and having multiple Twitter accounts makes it clear this is a marketing stunt. Third, what normal person - meaning outside the business - would refer to this as "some kind of viral ad campaign?" Perhaps Zack does work in the business so we'll give him that. The blog, Live For Films, writes, "The founders [of Wonderglen, a production company of sorts], Aidan Weinglas and Pieter Voorhees both have Linked In profiles and facebook pages. There is a Wordpress blog titled WonderGlen, give me a job!. MetaCafe has a video tribute to Wonderglen CEO Pieter Voorhees. Wonderglen's meta tag informs "WonderGlen is a cutting edge reality, documentary, mobile phone, ATM/kiosk, infotainment pod, and web 2.1 production company...for the 21st century." Wonderglen DNS information leads to DNStination, likely a DNS cloaking service. Email to DNStination have, unsurprisingly, gone unanswered. Videogum reports there is a "fake" job listing on the real job site Entertainment Careers for a Wonderglen Associate Producer. And there are more job listing on Reel Management. In Zach's email, he writes, "James Franco doing comedy videos makes me think of Judd Apatow, but what movie are they promoting? I also found the same video on Funny Or Die, so maybe it's a Will Ferrell thing?" Videogum mirrors Zach's Judd Aptow reference, writing, "Suspicions are aroused that the Wonderglen conspiracy might go to the very top echelons of comedy entertainment, like Judd Apatow or something." The Sound of Young America has a Variety ad (fake? real?) in which Wonderglen is mentioned and saluted by Pro+Create Management, The Uvus DeBaker & Boine Agency and Reel Management. Of the three companies, only one, Reel Management, appears to be real. Some forum posts have drawn comparison the Pieter Voorhees and Jason Vorhees of the the Friday the 13th movies series. And the mentions go on and on and on. Just do a Google search. If anything, the people behind this work have done a nice job spreading the work at the grass roots levels but nothing's bubbled up too far beyond that. Maybe it's nothing. Maybe it's something. Our best guess? We have absolutely no idea. As with most of these viral efforts, we get bored after a while. So to the people behind this, you now have your press. Now just tell us what the hell it's for. I can't see the James Franco video?? When you click on the link it doesn't go anywhere! I had the same problem with the link. The last letter isn't attached so you have to cut and paste the whole thing to see it. The video is pretty funny and the site has it's moments, but I don't get it. So it's like a tv show, but you have to read about what's going on in the office?